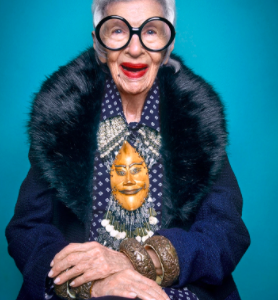 Never one to shy away from the public gaze, 96-year-old glamour girl Iris Apfel is at it again. Not content to rest on her laurels as a home-shopping network designer or public commentator on fashion trends, Apfel is about to release her latest book, Iris Apfel: Accidental Icon. With her unique blend of authority and the outrageous, Apfel continues to put out her imprint on how to live a life of authenticity and without apology, and with lots of color and pizzazz along the way. You can see a collection of some of her most stylish and provocative fashion choices here or watch her here as she travels to Hong Kong for the first time last year. Who knew life at 96 could be so joyous and colorful?